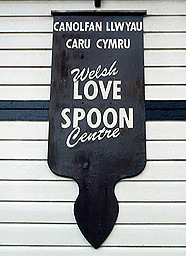 Welsh love spoon centre, quality clothing and gifts. 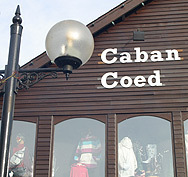 Situated in the centre of Betws-y-Coed, in the heart of the Snowdonia National Park is the Log Cabin/Caban Coed, a quality gift shop at affordable prices. Upstairs to our shop we have an extensive range of clothing from Lazy Jacks fleeces and hoodies to outdoor clothing such as Tog 24 and a very attractive range of Womens clothing from Adini and Pachamama. We have an array of handbags from the fashionable Oilily to the new and contemporary The Old Bag Company. 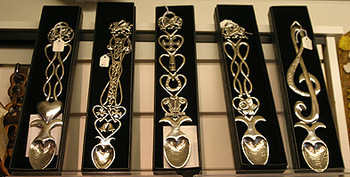 We also stock an excellent collection of the classic individually designed Ciccia bags and purses. We have a impressive range of footwear for all seasons such as the very popular Heavenly Feet shoes and boots to the Havaianas flip flops, El Naturlista shoes and the stylish Toggi boots. We have a variety of skinned rugs from sheepskin to goat and reindeer skins. Sizes vary from single, double, trebble to quad skins and they come in different shades and colours. We also have a selcection of sheepskin products such as, insoles, dusters, gloves and slippers. The majority of our products are available by mail order; if you should have any queries please feel free to ring or e- mail us, as we are always here to help you. We can post gifts worldwide. Privately owned and family run with helpful and experienced local staff the Log Cabin offers you a friendly efficient service. 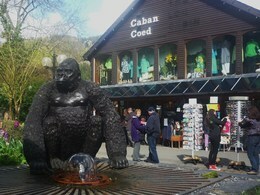 Aswell as Log Cabin we also have Village Crafts at the opposite end of Station Approach. The two shops are very different but both full of interesting and unique products.